While the links to history are obvious, there’s a distinct whiff of ‘I’ve a feeling we’re not in Kansas anymore’ about the Quad Platinum range. In my position as Audio Editor of Gramophone, I do occasionally have to disabuse people of a few well-rehearsed myths about the readership. No, the magazine’s readers didn’t all start with the first issue, back in 1923; no, they don’t all sit in book-lined studies listening to their music dressed tweeds and mustard-yellow waistcoats, a glass of port from a dust-encrusted decanter at their side; and no, while they’re not all listening to high-end set-ups with five-figure price-tags, neither do they all have systems last updated when Quad announced the 33/303 pre/power amplifier combination. In fact, I’ve always found the Gramophone readers a very long way from the stereotypical Home Counties retired colonels and the like: they – and the magazine – adopted the CD with alacrity, while some of the hi-fi magazines – and manufacturers – were fighting ‘over my dead body’ pro-LP rearguard actions. More recently, they’ve embraced SACD, and even high-resolution audio, to an extent many would find surprising – but then I recall a survey some years back showing Gramophone readers used the Internet more than those buying magazines more obviously aimed at the ‘yoof’ and ‘tech’ markets. That finding caused some head-scratching among the romper-suits in charge of the magazines, believe you me, but I guess makes sense when you see how ‘bricks and mortar’ retailing of classical music declined, to be replaced by mail-order operations offering superior deep-catalogue selections long before the online retailing boom kicked in. In my day-to-day dealings with the readership of the magazine (which to my amazement are now extending toward 15 uninterrupted years), I’ve found many to be just like any other audio enthusiast – only sensible. They’re passionate about their music, and want to be convinced that any change to their system will bring more enjoyment of their (usually extensive) music libraries. It’s an appealingly no-nonsense approach, and one that informs my monthly selection of products for review in the magazine: I’ll always choose a product likely to become a ‘keeper’ rather than some manifestation of a possibly transitory fad. For all those myths, I have to admit there remains a strong sense of affinity between the readers of the magazine and that manufacturer I mentioned earlier: Quad. Maybe that’s because the brand has historical link with classical music, not harmed at all by its long-running sponsorship of Gramophone’s annual CD guide (of blessed memory). 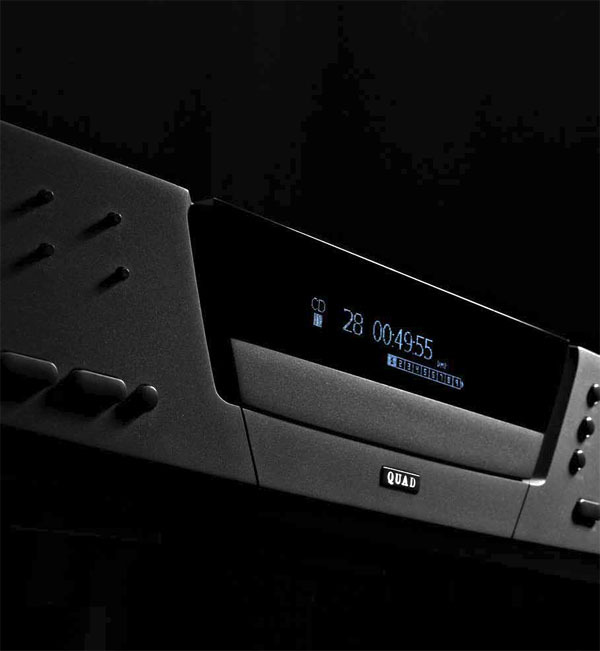 Maybe it’s that Quad products – from those famous pre-power amplifiers to the legendary electrostatic speakers – were just so well suited to the playback of high-quality recordings. Or perhaps it’s all down to folk-memories of Peter Walker’s famous ‘live vs. recorded’ demonstrations. Whatever the reasons, the two brands do seem to make a rather good fit. Or maybe it’s just that Quad equipment shares some of the same myths. I’m just working up a review of a couple of components from Quad’s Platinum range: the DMP CD player/DAC/digital preamp (above) and the Stereo power amplifier. The review will be published in the March issue of the magazine, which goes on sale next month, but having had the system delivered in the week before Christmas I’ve had the benefit of spending some more time playing with it than is usually allowed by publishing schedules – and I have to that over the last month, some of my preconceptions have been challenged, too. You see, I first saw the antecedents of the Platinum range getting on for five years ago, on the IAG stand at the always-enjoyable High End Show in Munich, and to say they were eye-catching for all the wrong reasons is perhaps being generous. The stack of components looked over-large, over-styled and over-the-top, leading a fellow journalist to suggest that the China-based owners of the brand had finally decided to bling up the brand and make a grab for a chunk of the status-symbol-led emerging ‘BRIC’ markets – Brazil, Russia, India and China –, with their newly-affluent middle classes. Time moved on, and various styling iterations of the products appeared at various shows until they kind of dropped of my personal radar, until a chance conversation had me wondering ‘whatever happened to…?’, Curiosity got the better of me, and so review samples were ordered up. As 2013 rolled into this year, the financial commentators were telling us that the MINTs (Mexico, Indonesia, Nigeria, and Turkey) were the new BRICs, and that the previous prediction of the rise of the CIVETs (Colombia, Indonesia, Vietnam, Egypt and Turkey) may have been wide of the mark. The UK’s big luxury car-makers – OK, German- and Indian-owned, but they manufacture here – were reporting huge success for top models in export markets, and planning to take on extra staff, and a delivery man was standing on my doorstep admiring the silver-printed black boxes he’d just put down and asking what was in them. That’s a first – a lot of exotic stuff comes and goes, and usually with no more than a ‘Sign here. Surname?’. Unboxing the Platinums revealed another surprise, and something you just don’t get from the pictures of the products: far from being huge, they’re actually narrower than the industry norm – 36cm wide plays the more usual 43cm or so – and thus surprisingly compact. Yes, the somewhat forthright styling, with the detailing on the front panels reminding me of some of those deco-inspired high-end Musical Fidelity products of the past, won’t be to all tastes, but the products look and feel built exceptionally well, and to my eyes are more appealing in the metal than on the page or screen. So, what have we got here then? Well, the two units sell for £2500 apiece, placing them at a suitable distance from the products in Quad’s Elite line-up: equivalent models in that range are about half the price. 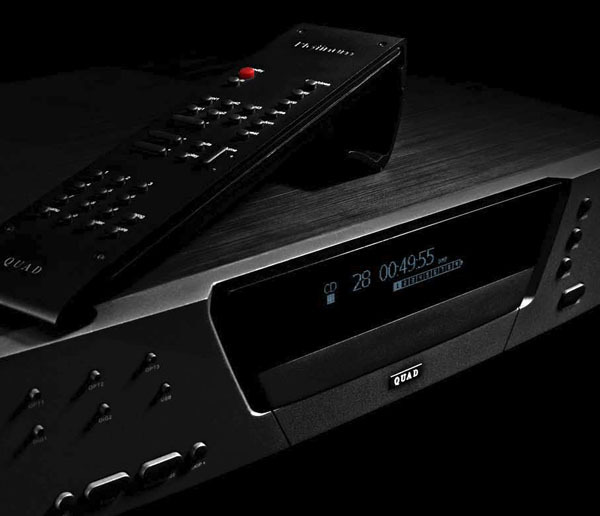 In addition to its high-quality CD transport, heavily engineered for smoothness of operation and longevity, the DMP has six digital inputs – two RCA electrical, three Toslink optical and one USB Type-B –, plus digital outputs on BNC, RCA, Toslink and AES/EBU connections, along with a choice of analogue outs on balanced XLRs or conventional RCA phonos. 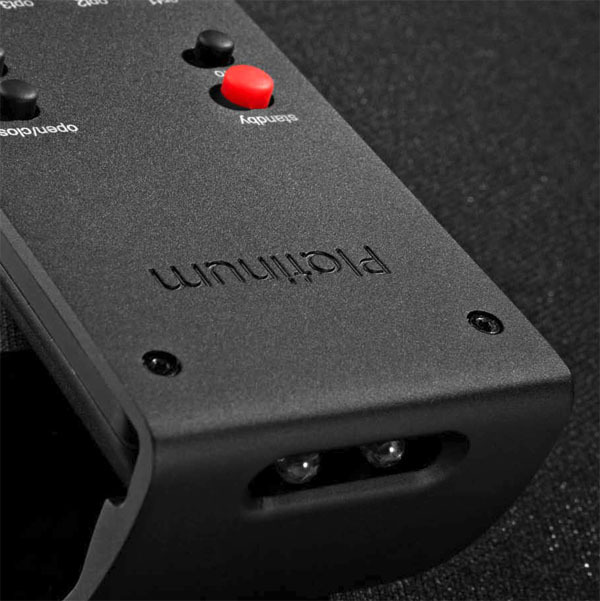 The outputs can be set to fixed level, allowing the DMP to be used with conventional preamplifiers, or variable for connection straight into a power amp, and the whole thing is controlled by a hefty metal-shelled remote handset, complete with an integral stand. The power amp in question here is the Platinum Stereo, only slightly boxy in its dimensions in the manner of past Quad amplifiers, and capable of 140W per channel, using what Quad describes as ‘a large number of output transistors, each one driven from its own driver transistor to maximise linearity. ‘This unusual output section enables virtually flat output impedance to be presented to the loudspeaker across the frequency domain, leading to a more natural dynamic performance throughout the audio spectrum,’ while ‘direct coupling of each stage is enabled by the use of a DC servo – a circuit that compensates for any unwanted DC voltage and removes it without affecting the music signal’. One thing that’s certain when any piece of equipment spends more than a few days around these parts is that it gets worked hard. Working at home as I do, I have at least one audio system running from around 7am until at least 10pm, and for the past few weeks the Quad player and power amp has been the main system in use in the house. That means it’s done everything from providing all-day radio and playing network-stored music via a USB connection from a computer, to playing CDs and even carrying TV sound via one of those digital inputs. In other words, it’s been used just as it would in the real world, except probably much more intensively. And while extensive use has revealed the sound conforms to the commonly-held view of how Quad equipment sound – the combination’s presentation is big and rich, with no nasty hard edges to the treble, making it a remarkably easy-going listen – it’s also able to punch harder than mythology would have you expect, and drive a wide range of music to exciting effect. In fact, there’s nothing slow or overlush at all going on here, but instead a superbly detailed, vibrant and involving sound whether playing CDs or decent-quality content fed in through that USB input. Indeed, I’d go so far as to suggest that, while the CD-playing section of the DMP is very good, the star turn here is the digital-to-analogue conversing, offering upsampling to 24-bit/192kHz and a choice of digital filter settings offering slow or fast roll-off. Using my usual MacBook Air computer connected to the Quad, and using Audirvarna and Amarra players, the Quad proves capable of quite remarkable scale and detail, whether with classical downloads or well-recorded rock or jazz ripped from CD. Set-up is a breeze – the DMP is plug and play with Macs, but needs drivers for Windows computers. These, along with installation instructions, are provided with the unit. Yes, it sounds far from impressive when used with low-bitrate content or just fed from a computer playing music via iTunes, which sounds bleached and uninteresting even with lossless or uncompressed content. Use higher-quality player software, however, and the DMP is fully able to do what it does: the upsampling seems to contribute to clean, precise sound, and while that switchable digital filter gives you a choice of smoother or sharper, it’s selectable from the remote handset, so which position to use is really down to personal choice, and either position retains the essential attractive qualities of the player/DAC. What’s really deceptive about the Quad combination is that it makes everything it does seem so easy: recordings are opened up and made compelling, and yet require very little effort from the listener. Yes, the Quads will do the ‘lean forward’ thing, rewarding close attention with superb insight into a good recording, but they’re just as impressive in ‘lean back’ listening mode, when you relax into the music – any music – and just let them do their thing. The power amp is also a gem: it has excellent grip and control, ensuring speakers connected to it sound taut and focused, and play rhythms cleanly and crisply without any sense of smear or lack of dynamics. That’s effective for all kinds of classical music, and serves jazz very well, as you might expect – but what it also does is make rock, pop and dance tracks really thunder and growl out of the speakers. Which is nice. Even better is that the Quad combination will go seriously loud – way beyond usual ‘exciting’ levels and well into air guitar territory – without the slightest sign of stress or strain. The Stereo power amp feels like it has limitless reserves of power, and most speakers will start showing signs of reaching their mechanical limits before the amp is getting anywhere near running out of puff, which I assume it will do eventually – I chickened it when the levels were still going up, out of respect for my hearing. Yes, that loud, and still clean as a whistle: this is an amplifier fully able to rock out when required, and do so with real verve and conviction. The Platinum is a deeply impressive power amp, lacking the sheer bulk of the archetypal US muscle-amp, but still with plenty to give from its compact enclosure. Meanwhile the Platinum DMP is far from unique – and may seem slight overkill if you already have a decent disc player and really only want a high-quality DAC/digital preamp –, but there’s no denying the appeal of the two units used together as a system. This is a Quad player and amplifier capable of serious snarl and grunt, and able to play the grittiest of tracks without misting them over with a mask of refinement, and a Quad amp able to drive as hard as most of us would ever want, and for as long as we could desire, while still seeming to be well within its limits. For those with the ‘tweeds and mustard waistcoat’ view of the brand and its users, such qualities will seem completely out of character, but for a brand seeking to widen its appeal, such qualities are highly desirable. And that’s the really clever trick this player/amp combination pulls off: the kind of velvet glove balance and control likely to please those with a stereotypical view of the Quad sound, while at the same time keeping hidden up its sleeve a few dodgy tattoos as evidence that it knows how to look after itself in a fight. That’s come as a real revelation during the time I’ve spent with the DMP/Stereo, and is what makes this combination so much more than just a simple exercise in taking the brand upmarket. where can I find free downloads on CDG for the karaoke machine I bought? How does the sound of the Quad Platinum compare with the new Sony TA-1ES amplifier ?, I found the former very good but unable to get an audition of the latter. I can now answer my own question the Quad amp sounds very good, the Sony I can not listen to for the reasons I made under your Sony amp review. However unfortunately I can not use the Quad either because being into mch SACD when I connect the Quad Platinum to the pre-out of the excellent Sony DA5400ES AVR for driving my front speakers I get hum. As expected no hum when connecting the Sony amp or any other amplifier. I suspect the Quad amp omits relays and this its achilles heel ?. Livingstone, James. The most satisfying sound I have had, and now hooked up to my current Platinum DMP / Pre / Power set up, is with Triangle Antal Anniversary floorstanders. This is one of the most enjoyable combinations I have heard at any budget. I also tried the Quads with my ELAC CE 310s from my other system for fun and was amazed at what they could do. The small ELACs really appreciated the stability and grip the QUAD Power provided; showing casing just how good these diminutive little jems are. I imagine newer Elac BS 403s would sound great if you were looking for a stand mount. I haven’t played about with cables and am interested in others’ recommendations. Chord Cobra II interconnects and NAIM NACA speaker cables are what I currently use as they are what I had available. Although I am lead to believe that Quad no longer market their own brand cables, a Quad engineer who worked on the Platinum design commented that the cables they had used when designing it had significant silver core. Not sure how helpful that is, but I will probably upgrade to a single make / range loom in the near future. Nordost Leif Red Dawn perhaps. 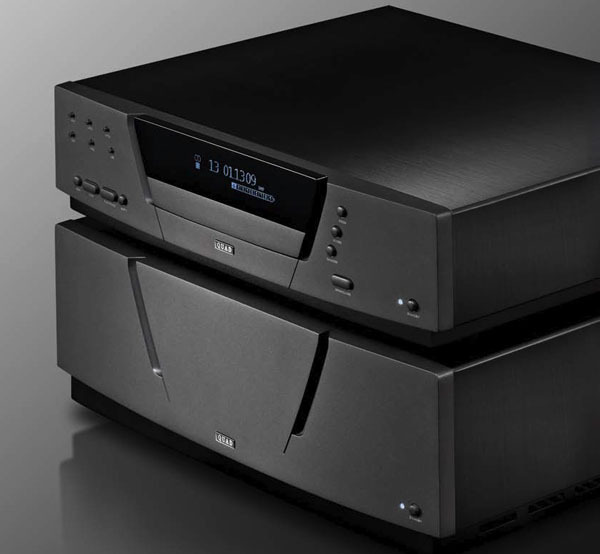 ← The dawn of the High Resolution Audio age – maybe next year, eh?